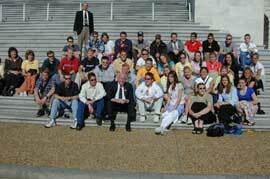 Seniors in high school on a field trip pose on the steps of the U.S. Capitol with a member of Congress. Photo Courtesy of Office of Congressman Ehlers. For many high school seniors, one of the highlights of their last year in high school is the class trip. Class trips usually involve travel to a distant destination where the class will spend several days sightseeing and taking part in different activities. One of the most popular destinations for senior class trips is Washington D.C. Students usually tour the United States Capitol Building and meet the senators and representatives from their state. They also visit many of the historic sites and monuments found in the area such as the Lincoln Memorial, Arlington Cemetery, and many national museums, such as the Air and Space Museum. Other popular places for senior class trips are New York City, and Disney World in Florida and Disney Land in California. Some high school senior classes travel to countries in Europe or Asia. Seniors often pay for their class trips through fund-raising events. They might raise money by holding car washes, selling special food items, and sponsoring auctions. Sometimes, to save on transportation costs, the class will charter buses instead of flying to their destination. Teachers and parents accompany the students and act as chaperones for the trip.